Friend of the blog Allen informs me that the audio book of Metropolitan is now available, narrated by Emily Woo Zeller. I’m sure City on Fire was recorded at the same time, so probably by the time you finish listening to this one, the sequel will be available. So there’s no reason to hesitate! Find it on Amazon/Audible or iTunes. My agent has been doing a good job at selling audio rights, and there are some new audio books available that might pique your interest. Angel Station appeared a few months ago, narrated by the excellent Neil Hellegers, and is available via Audible and iTunes. 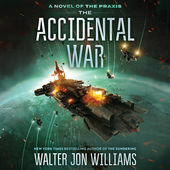 And of course the audio of The Accidental War was released at the same time as the novel, and can be found hereabouts and thereabouts. 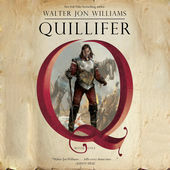 And while we’re at it, I should really recommend the audio version of Quillifer, because the narrator Ralph Lister, being a classically trained British actor, is just such an utterly perfect match for the material. It’s also available at Audible and iTunes, what a surprise! There’s lots of great listening ahead for you! So don your earbuds and enter the world of audio! All truly brilliant books. I only wish there was a shot at Metropolitan III. There is, but not for a couple more years. Excellent! I have started saving my shekels now in anticipation. This sub-genre needs a name: Spell-Punk. Metropolitan was labeled “science fantasy” when it was first released, and it seemed to be a part of a mini-trend that included Swanwick’s “Iron Dragon’s Daughter.” But nobody sat down and wrote a Science Fantasy Manifesto to explain what it was and why it was important, and it faded away. But if someone wants to write that now, with whatever label folks come up with, and explain how I’m the direct ancestor of all these writers, then that would be pretty wonderful. I can’t do it myself, because it would seem too much like self-promotion, but y’all go ahead. And I just now remembered that when I was writing it, I called it “Totally Urban Fantasy” (TUF), meaning that all the fantasy elements were derived from the urban setting. But Urban Fantasy means something else now, so that wouldn’t work. “Fantasy with Rivets?” Not punchy enough.